Little Weasel is a character in the 3D Universe who appears as a minor character in Grand Theft Auto: San Andreas (set in 1992). Little Weasel is a member of the Ballas gang. His voice actor is not credited in the games manual. Little Weasel, presumably born in Los Santos, at an unknown time became a member of the Ballas gang and rose through the gang, knowing 'Front Yard royalty' such as Kane. In 1992 he had also begun to work with Frank Tenpenny, and presumably Eddie Pulaski, of C.R.A.S.H. and resided in the Glen Park neighbourhood of Los Santos. 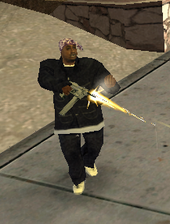 The Grove Street Families, the arch rivals of the Ballas, had decided to extend their influence in the city and, through the work of Carl Johnson on orders from his brother, the neighbourhood became controlled by the Grove Street Families. Little Weasel, in an attempt to keep the neighbourhood a Ballas territory and escape from his home, ran out to confront Johnson, shouting that Frank Tenpenny had set him up, but was killed. He was later buried at the Los Santos cemetery in Vinewood, although his funeral was ambushed by Johnson and Sweet, who killed Little Weasel's associcate Kane. Little Weasel does not have a unique character model, sharing his design with one of the normal Ballas gangster model designs. Text during the mission Doberman refers to Little Weasel as a 'grass', although the meaning of this is not revealed. This page was last modified on 22 January 2014, at 00:20.